BUENOS AIRES, Argentina — The world’s top financial officials meeting in Argentina’s capital on Sunday called for more dialogue on trade disputes that threaten global economic growth with one official warning that differences remain and tensions could escalate further. 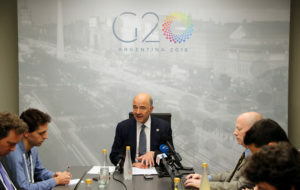 The two-day gathering of G-20 finance ministers and central bankers in Buenos Aires took place as the United States and China are engaged in a full-blown trade war with both nations imposing tariffs on billions of dollars of each other’s goods. A final communique from the meeting said that although the global economy remains strong, growth is becoming “less synchronized” and risks over the short and medium terms have increased. Representing the U.S. at the meetings is Treasury Secretary Steven Mnuchin, who on Saturday said the overall U.S. economy has not been harmed by the trade battles set off by Trump’s get-tough policies. But he acknowledged that some individual sectors have been hurt and said U.S. officials are looking at ways to help them.